But it’s not enough to adapt advertising to accompany customers as they move across devices and across platforms. To maximize investments and conversions companies must also understand the strengths and weaknesses of each individual channel, stay current with consumer usage trends and combine these insights to architect an effective cross-device, cross-channel strategy. This is where Mobile Advertising Around the Globe 2016, the annual report produced by Marin Software Incorporated, a cross-channel, cross-device performance advertising cloud provider for advertisers and agencies, sheds important light on spend, performance and usage across the channels that define the consumer journey. Vendor spin aside, the research, drawn from a sample of advertisers who invest more than $7 billion in annualized ad spend on the Marin platform, provides marketers a solid benchmark chock-full of facts and actionable recommendations for optimizing advertising and approaches in order to reach and engage consumers across search, social and display. However, it’s also important to keep in mind that the findings—because Marin Software’s client bases consists largely of companies spending upwards of $100K on paid search, social and display—are likely biased towards larger advertisers and may not reflect the trends small and medium-size businesses need to have top of mind. Significantly, the report also calls out mobile app advertising as a must, noting that apps “already account for almost 90% of all time spent on mobile devices” with more than half (60%) of mobile users saying they use apps on a daily basis. This, the report stresses, makes mobile apps advertising an important tool in any marketer’s toolbox, with in-app ads an important way to reach consumers and engage them.” This goes double for social media, as Facebook is the most used app on smartphones and tablets. Effective advertising targets audiences on the platforms they prefer, and that platform is increasingly mobile. 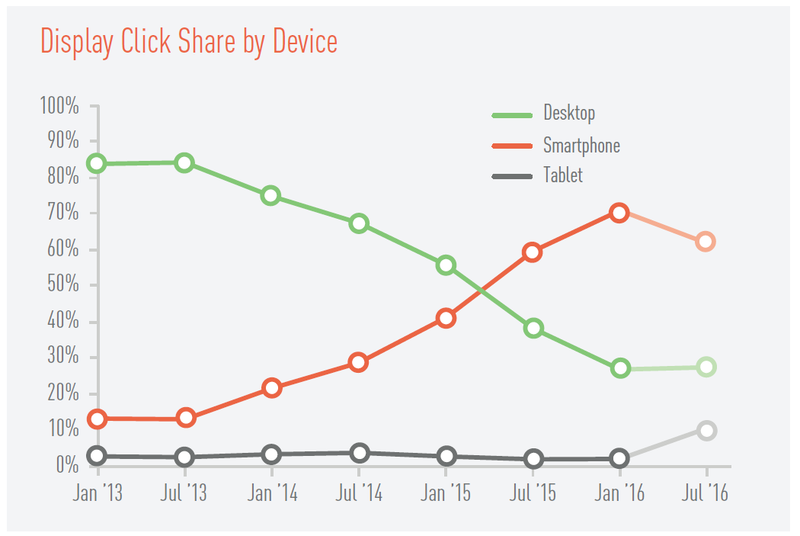 The report notes a “steady shift” in click share away from desktops to smartphones. While this finding won’t come as much of a surprise for seasoned marketers that “get” mobile, report data that shows tablet click behavior “has been relatively flat” is an eye-opener. In one year, (comparing December 2014 versus 2015) smartphone click share grew by over half, from 22% of global search clicks to 35%. However, the report points out this growth didn’t come at the expense of desktop usage. “Rather, tablet usage is decreasing and smartphones are not taking more click share away from tablets than desktops.” Read between the lines, and it seems that tablets are losing some of their appeal, which is a natural outcome of the massive increase in smartphone adoption and use worldwide. When it comes to display, click behavior is flat for tablets, holding steady at around the 10%. By end-2015, the vast majority (71%) of all display ad clicks were on a smartphone and the report forecasts this trend to continue this year. Clearly, mobile devices are attracting more “eyeballs” and chalking up more clicks than ever before—a development that should help advertisers and publishers prioritize how and where they allocate their budgets. The report correctly advises marketers to stay current new ad formats and innovations such as video and banner ads tailored for more effective and engaging mobile display. But it’s not enough to use new ads formats to enhance the overall advertising experience. Companies are also advised to sharpen targeting across channels (and tracking technology to monitor results) in order to increase consumer awareness and keep a lid on costs. Peggy Anne Salz is the Content Marketing Strategist and Chief Analyst of Mobile Groove, a top 50 influential technology site providing custom research to the global mobile industry and consulting to tech startups. She is a frequent contributor to Forbes on the topic of mobile marketing, engagement and apps. Her work also regularly appears in a range of publications from Venture Beat to Harvard Business Review. Peggy is a top 30 Mobile Marketing influencer and a nine-time author based in Europe. Follow her @peggyanne.